"A spicy version of this classic soup. The smokiness of the adobo sauce and the bite of the chile balance the savory flavors of the potato and cream. Cumin and white pepper finish off this cozy soup. Best enjoyed next to a fire with a glass of red wine. Serve piping hot topped with sour cream and croutons or cheese and onion rings!" Melt butter in a large pot over medium-low heat. Add leeks and salt; cook, stirring often, until very soft, about 20 minutes. Stir in red bell pepper and garlic; cook and stir for 2 minutes. Add chipotle pepper, cumin, thyme, and white pepper; cook and stir for 2 minutes. Stir vegetable broth and potatoes into the pot. Bring to a boil; reduce heat to low and cover. Simmer soup, stirring occasionally, until potatoes are tender, about 30 minutes. Stir in milk and cream. Remove from heat and let cool slightly, 10 to 15 minutes. Puree soup with an immersion blender to desired smoothness. Simmer until heated through, about 5 minutes. 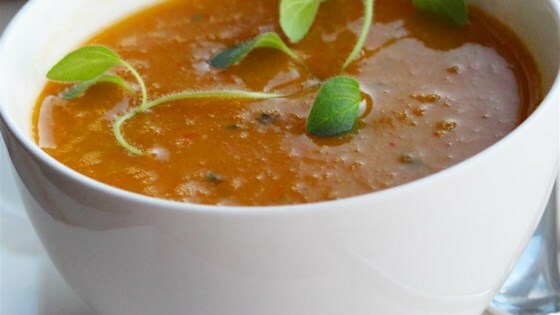 Serve this refreshing and simple soup, hot or cold! Substitute fresh thyme for the dried if desired. For a healthier version, use less or no cream at all and add more stock or water to get the right consistency. Use a blender instead of an immersion blender to puree the soup if preferred. It was a very cold fall day, so I was in the mood for a great hot soup. I made this to the T, but I found it lacking in flavor. It was hot and filling, but not a repeat for us.